The state of Virginia doesn’t necessarily have the cherished distilling pedigree that states like Kentucky or Tennessee enjoy, but Old Dominion’s whiskey chops are pretty damn impressive none-the-less. One of my favorite ryes comes out of Virginia (Roundstone Rye), and I’m in love with the Bowman Brothers series of bourbon from A. Smith Bowman (owned by Sazerac). 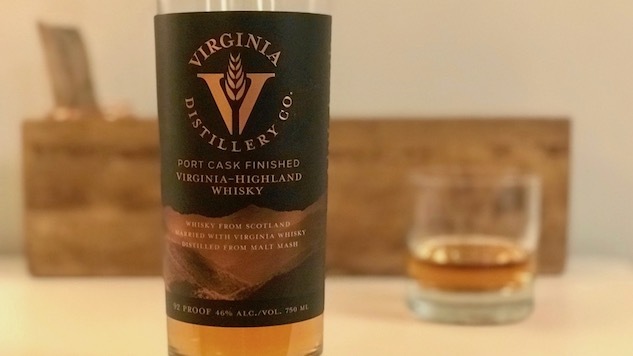 Now there’s another whisky producer coming out of Virginia that we all need to pay attention to: Virginia Distillery, which is focusing on single malt and blended malt whisky (notice we dropped the “e” there). The fledgling distillery is part of the American boom in single malt production, using barley from the U.S. and water from the surrounding Blue Ridge Mountains. Their signature product, which they’re calling Courage and Conviction, is being aged in sherry, cuvee and bourbon casks, but it’s not ready yet. They want it to age for at least three years and are hoping to release that stuff in 2020. In the meantime, they’re blending some of their young whiskey with well-aged sourced whisky from Scotland and calling it Virginia-Highland Whisky. After blending the old whisky with new whisky, they age it in a variety of different casks before bottling it. There’s a variation that’s aged in cider casks, one that’s aged in Chardonnay casks and one that gets some sort of beer barrel treatment. I got the chance to try Virginia-Highland aged in port casks and fell in love immediately. Full disclosure: I’m a sucker for anything finished in port barrels, even though I don’t care for port itself. Weird, right? The human being is a complex species full of mysteries. Anywho…I’m not sure how much of their own whisky Virginia Distillery puts in this bottle, but I’m guessing it’s not a lot because there’s a rich depth to the color when you pour it neat. And it’s fragrant as hell, smelling like cherries and wood. That fruit dominates the sip as well, as the whisky delivers sweet notes of raisins and cherry that force the typical toffee and vanilla notes to play second fiddle. There’s some heat here (this bottle comes in at 92 proof), as well as a thin layer of salinity that lingers on your lips after the sip is gone. What isn’t present at all is the smokiness you usually associate with malted whiskey. If you’re in love with Scotland’s signature peat characteristics, you’re going to be disappointed. If you think drinking peaty scotch is like sucking on a cigarette, you’ll dig this whisky and wallow in the stone fruit notes. And you won’t be alone. This bottle won gold at San Francisco World Spirits Competition and the World Whiskies Award for Best American Blended Malt. I like this whisky less when I add a big ball of ice. The toffee comes forward, and the heat disappears, but it loses some of the cherry and wood notes that made it so distinctive. In my opinion, drink this one neat. And keep your eye out for other releases from Virginia Distillery. If this blended whisky is any indication, their single malt should be worth checking out.